The Asian Art Museum of San Francisco organised this exhibit in 1995 to highlight the pioneering efforts of three important collectors of Chinese glass. This book contributes significantly to the literature on glass by illustrating the entire history and development of glass with works previously unavailable to the public. Each page is illustrated with a specimen and includes remarks as to the process for making it and specific traits of the piece. 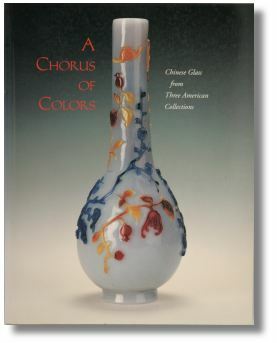 A Chorus of Colors: Chinese Glass from Three American Collections, edited by Michael Morrison, catalogue entries by Claudia Brown. San Francisco: Asian Art Museum of San Francisco, 1995. Catalog of an exhibition at the Asian Art Museum of San Francisco of three private collections, providing color illustrations of objects dating from the Han to the Qing period.